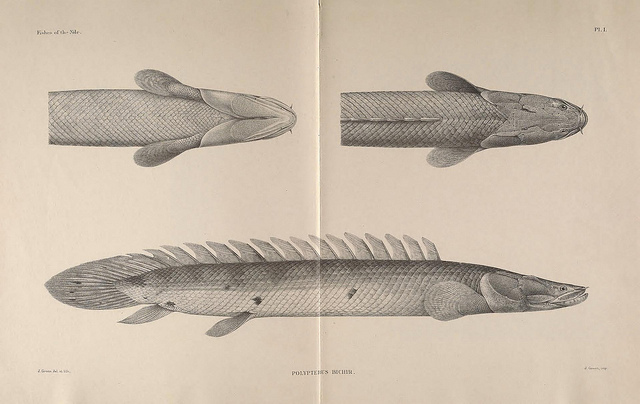 The fish on the picture on top is a bichir, and it belongs to a fish order quite fascinating for researchers. Especially one representative of the bichirs, that goes by the name of Senegal bichir or “dinosaur eel”, was of special interest lately. The fish of the order of the Polypteriformes (meaning it has lots of fins) has not only lungs and gills, but also ossified, strong pectoral fins, to occasionally walk on land. The ability to walk and breathe air led to an experiement, when researchers of the McGill University in Canada raised the dinosaur eels for eight months — on land. Of course they had to take care that the fishes won’t dry out. But because they move on land from pond to pond the fishes were kind of used to the situation. The experimental arrangement consisted of a mesh and enough water for the fishes to stay in normal shape, but also too little water to just swim. The researchers also formed a control group using 38 fish growing up in their usual aquatic environment. The results of the research illustrate very clearly the changes that might have enabled fins to become limbs when some fish decided to trade water for land, around 400 million years ago. And that was, as we all would have to admit, a big step that would help the rise to tetrapods, including almost all land vertebrates from amphibians to mammals. And the fish walk looks like this, do you see conformities in style to, let’s say, humans? Take a moment to think about rubber. We all need the flexibel waterproof material everyday without noticing it. And so does the world’s economy. Millions of things are made of rubber, tires for cars for example, the soles of shoes, rubber balls for kids to play, airbeds… And what about all these lovely rubber ducks without whom every sunday bath would be incomplete? 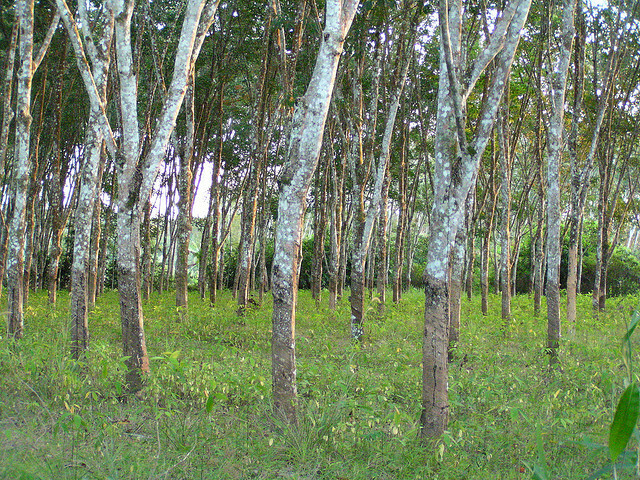 Although rubber can be produced synthetically, lots of the material still needs some 40 percent or more of natural rubber, coming from rubber trees. And since those trees are prone to diseases and can be affected by bad weather, scientists try to find a replacement. And they found one: Dandelions. Those yellow flowered plants contain a white, milk-like liquid that has the potential to become rubber. 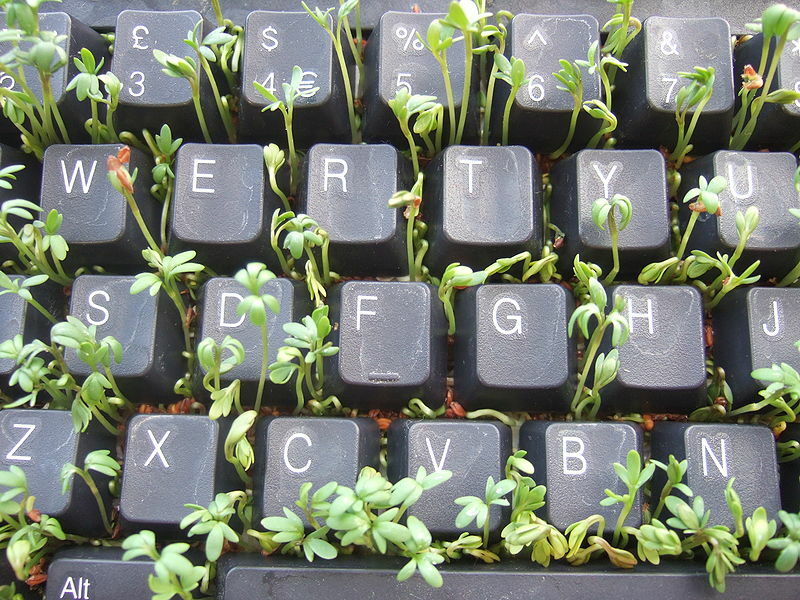 The success of the process depends on the strain of the plant itself. 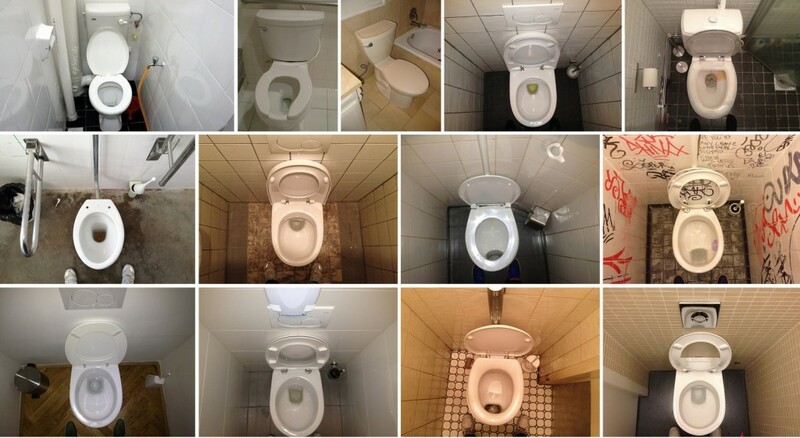 Some are more suitable than others. It’s possible to harvest at least some kind of rubber (for example for rubber bands) from every Dandelion. Besides dandelions tend to be a very tough weed, growing even under adverse conditions such as poor soil or a changing climate. Luckily for the whole tire and maybe the rubber duck industry, a dandelion strain from Kazakhstan seems to have a saviour-potential. The plants taproot yields that milky fluid – with tyre-grade rubber particles in it. So molecular scientists at the Fraunhofer Institute are working to secure the future of road transport if the tree goes the way of all flesh. So let’s hope that the research will be a success, otherwise the rubber duck in the video below will probably be all alone forever. And don’t you want to have one of these in your tub (even if it has to be a very very big tub)? The duck was created by Dutch artist Florentijn Hofman. It sailed into the Port of Los Angeles on August 20th, 2014 and is said to be the “world’s largest rubber duck,” being six stories tall and with a weight of 11 tons. Biodiversity is good we are told. And that’s why it might be hitting your app store soon. While security software needs to constantly adapt to the latest internet scares, there has so far been no general way to counter viruses and malware messing up your smartphone. Now, scientists are looking to nature for help. Just as a population of species benefits from genetic variety to become more virus-resistant, so can software – in theory anyway. But computer scientist Michael Franz has outlined how diversity can be introduced into software in an automated fashion and on a large scale. Ideally, this happens right at the source, such as in app stores for smartphones and tablets. The idea is that if a virus needs to adapt to millions of slightly different versions of what is functionally the same program, criminals will have to commit way more time and money to code malware – and as a result will have a lot less enthusiasm doing so. But if the app store automatically generates slightly different versions for each user, is there a guarantee all of them will work? Franz claims yes, but admits that the very idea of pushing for software diversity undermines what is essentially an article of faith in the software industry. Well, we’d say, if that includes criminals – so be it. Reducing greenhouse gas emissions, ensuring food security and fighting the spread of deserts are among the biggest challenges facing humanity. But the solution for all of them may literally lie inside humans – as we hope to show in this bog post -pardon – blog post. Human waste has traditionally been used in some parts of the Amazon to create Terra Preta – black soil rich in nutrients – the result of mixing charcoal and human faeces into otherwise less fertile soil. Not convinced? Well, to learn more you may have to wait: the makers of the documentary are running a bit low on cash to complete post-production. To help fill their coffers go here. Braving hungry crocodiles, Asiatic lions, wild elephants and traveling in camel caravans– sound like an Indiana Jones movie? It’s what some election officials in India have faced in recent days trying to do their job. Pulling off a parliamentary election in the world’s largest democracy is never an easy task. Apart from the mind-boggling logistics this time (814 million eligible voters; over 930,000 polling stations; nearly 6 million poll workers), India’s physical size and topographical diversity trigger an obstacle course for some poll workers. From snow-bound mountains in the northern Himalayas, the deserts of western Rajasthan, tropical jungles to tiny remote islands in the south, some poll officials have to navigate a variety of routes to ensure citizens can cast their votes. And, a few election officials have also had to brave the teeming wildlife that comes with the terrain. There were also reports of officials trudging through tropical jungles inhabited by snakes and traveling in camel caravans to reach settlements in the Thar desert in northwestern Rajasthan. 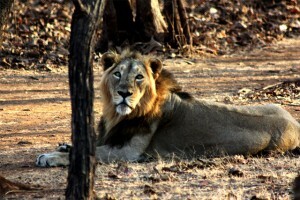 Big animals were also very much on the mind of a polling team that traveled to the Gir forest in the western state of Gujarat – home to the majestic Asiatic lion – to cater to a lone voter in a hamlet there. Election rules in India say there must be a polling station within two kilometers of every residential community. And, earlier this month, election officials in the northeastern state of Meghalaya had to contend with a herd of wild elephants that blocked the way to two polling stations. They were eventually chased away into the jungle by forest rangers.